this ancient and distinguished surname is of Old French origin, and is a locational name from any of the various places in North France, such as Aubigny or Aubigne (Brittany), named with the Gallo-Roman personal name "Albinius", a derivative of "albus", white, and the local suffix "-acum", settlement, village. The name was introduced into England by followers of William the Conqueror in the wake of the Norman Conquest of 1066, and has the distinction of being first recorded in the Domesday Book. William de Albini, "the butler d'Aubignie", attended William the Conqueror, and in the reign of Henry 111 (1216 - 1272), Godfrey Giffard, rector of Attleborough, Norfolk, was presented by one Hugh de Albany. In 1272, William de Albania, or Albany, was recorded in the Book of Fees for Nottinghamshire, and a Walter de Albenay was noted in the Book of Fees for Lincolnshire, also in 1272. Another William de Albini, or D'Aubigny appears in 13th Century Records of Norfolk. Robert Steward (1340 - 1420), regent of Scotland, was created Duke of Albany in 1398. His name derives from Albany, Albainn or Albin, an ancient name applied to the northern parts of Scotland, inhabited by Picts, and named from the Celtic "alp", rock, cliff. On May 31st 1551, William Albany and Thomasyne Buttell were married at St. Pancras', London. 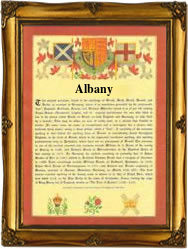 A Coat of Arms granted to the Albany or D'aubigny family is a red shield with an eagle displayed within a silver bordure. The first recorded spelling of the family name is shown to be that of Nigel de Albini, which was dated 1086, in the Domesday Book of Buckinghamshire, during the reign of King William 1, known as "William the Conqueror", 1066 - 1087. Surnames became necessary when governments introduced personal taxation. In England this was known as Poll Tax. Throughout the centuries, surnames in every country have continued to "develop" often leading to astonishing variants of the original spelling.